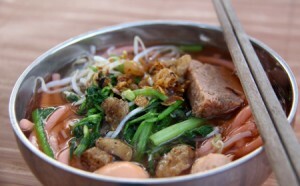 At first glance, and at first sniff, bun do is similar to bun rieu cua (rice vermicelli with dried shrimps, ground field crabs and tomato soup), a common street food in the southern region. But, as anyone who has had it will tell you, bun do is different. The cake (rieu cua) in bun do is made with field crab flesh, pork and tiny shrimps, all finely ground. Its broth is cooked with pig bones, cow bones and crabs. The typical red color comes from achiote seeds and crab roes added to the broth. Its toppings include quail eggs, pork blood pudding pieces, fried shallot slices, and fried pork rinds. Finally, the bun, or rice vermicelli is as thick as chopsticks, like tapioca noodles in banh canh. Before serving bun do, sellers typically put the bun into the broth pot for about 10 minutes to get its desirable texture, so it is colored red. For bun do, accompanying vegetables include can nuoc (Japanese parsley) and bean sprouts, and they must be cooked, unlike other kinds of bun that can be eaten with either fresh or cooked vegetables. In Buon Ma Thuot, the food is almost everywhere, from big streets like Le Duan and Nguyen Van Cu, to small alleys and in markets, but only available after 3-4 p.m. Previously, the most famous seller of bun do was a stall at the crossroads of Le Duan and Phan Dinh Giot, but for some reason it has lost its touch recently. I would like to recommend food courts at the Tan An and Ea Tam markets, but your safest option is to have some local tour guide tell you where and how to eat a good bowl of bun do. The dish is at its best when eaten in a chilly evening in Buon Ma Thuot.